DonorSnap allows you to create Ticklers (reminders) for each of your contacts. This feature is an automated way to keep track of your “Things to Do” and then to have the system send you an email reminder if they aren’t done by a certain date. Each Contact has a Tickler tab which lists any Tickler item that had been created for them. Items that do not have a Date Complete are open items that are subject to the automated reminder system. Ticklers can be assigned to a specific person. 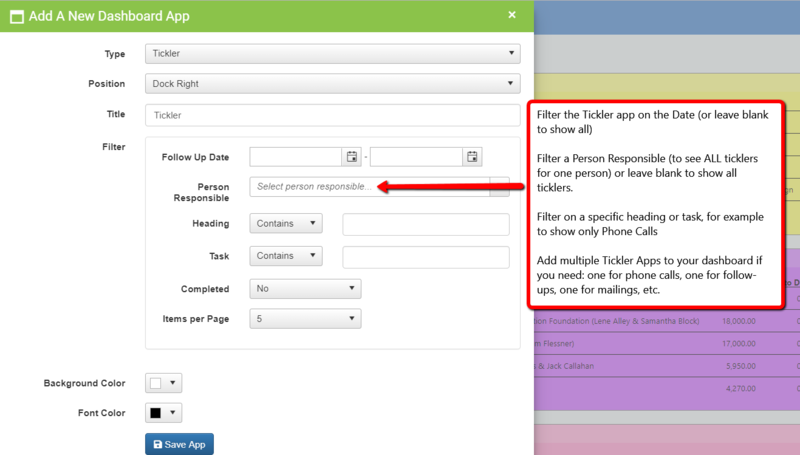 This assignment will help with filtering on your Dashboard App, and the Tickler Person responsible can receive emails when the Tickler items are coming up, and past due. Build this list under Community > Tickler Person Responsible. Ticklers are visible on the Dashboard (the Home page) when you create the Dashboard App. Filter ticklers on the Person Responsible (to show only those Ticklers assigned to you); or leave the Person Responsible field blank to show ALL ticklers out there. 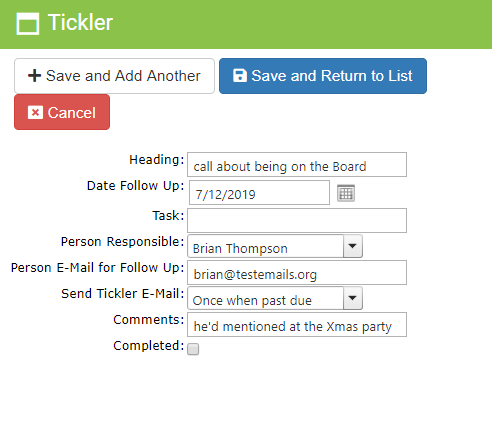 Tickler Emails will be sent to the Person Responsible assigned, prior to the due date of the Tickler, or After the date is past due.